HTX was an Amiga-based "communicator" and "enabler" software for people with disabilities. Thanks to a diversity of input and output interfaces, HTX was able to help in particularly challenging situations, such as persons who were unable to see, speak, and move. HTX included a text editor module, a simple graphics module, and an interface to control external devices. Speech synthesis was used both for input selection and feedback, and in screen reader mode. Originally released in 1987 in Italian and English, thanks to its Amiga foundation which included all required multimedia and I/O interfaces HTX was revolutionary in terms of both features and affordability, easily matching systems based on 8-bit technology that cost 5-10 times as much. In the process, new references were also set in affordable Italian text-to-speech (TTS) quality. Being based on alternative hardware also meant being faced by "resistance" from traditional channels. The Amiga's decline and eventual demise also didn't help. In 1990, the software was made available at no charge in cooperation with some Lions Club organizations. HTX was designed to meet the communications and creativity needs of persons unable to express themselves using traditional means, such as their own voice, a pen, or a standard keyboard. HTX quickly proved itself as an invaluable tool to users with certain spinal and cerebral lesions and, thanks to its voice synthesis capabilities, even in cases of low vision or total blindness. This powerful, yet easy to use software could be controlled with a variety of input devices, ranging from microswitches to big pull-buttons, to electronic sensors. HTX also supported standard and non-standard keyboards, as well as mice, trackballs and other analog input devices. Different devices could provide input at the same time. Optical pointing devices and other types of head tracking systems have been successfully used with HTX. 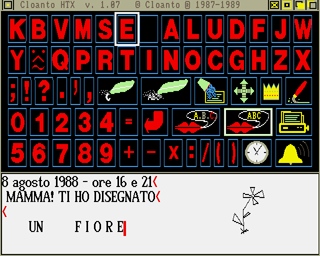 The main HTX screen is divided in two parts: the selection and control part, containing all objects which can be selected, and the editing part, containing the text or graphics created by the user. All features are fully usable with vocal assistance and feedback provided either in addition or alternatively to the graphical user interface. The text editor can use proportionally spaced fonts in any size, and includes standard editing tools plus automatic capitalization, spacing and error detection and correction, plus a user-definable dictionary of words and sentences. The speech synthesis provides both guidance and feedback. Pitch, speed and other voice attributes are user-configurable, and the user can interrupt the speech output, running in parallel with the main program, at any moment. The software includes a function to read out an ASCII text by browsing through it with the mouse. Acoustic alarms can be set both for the user and to call for assistance. The computer clock can be used to control events and to provide vocal or textual information. Remote controls to switch on and off external devices have been used experimentally. Braille printers have also been used with the software. A rich set of parameters allows the software to be configured and reconfigured on the fly for a variety of needs. This makes it a very interesting "universal" tool for schools, hospitals and other communities. The development of HTX was completed several years ago. As our later work led us through other paths, we still have an active interest in this field. Perhaps a future project will incorporate both the features of HTX and the precious experience gained with it, plus our current vision, combined with the capabilities made possible by hardware advances. The original HTX software is still supported, and may be available at no charge through charitable institutions.